Nothing says comfort food like chicken pot pie. Chicken and vegetables in a rich and creamy sauce topped off with a flaky crust makes for a satisfying one-dish meal. 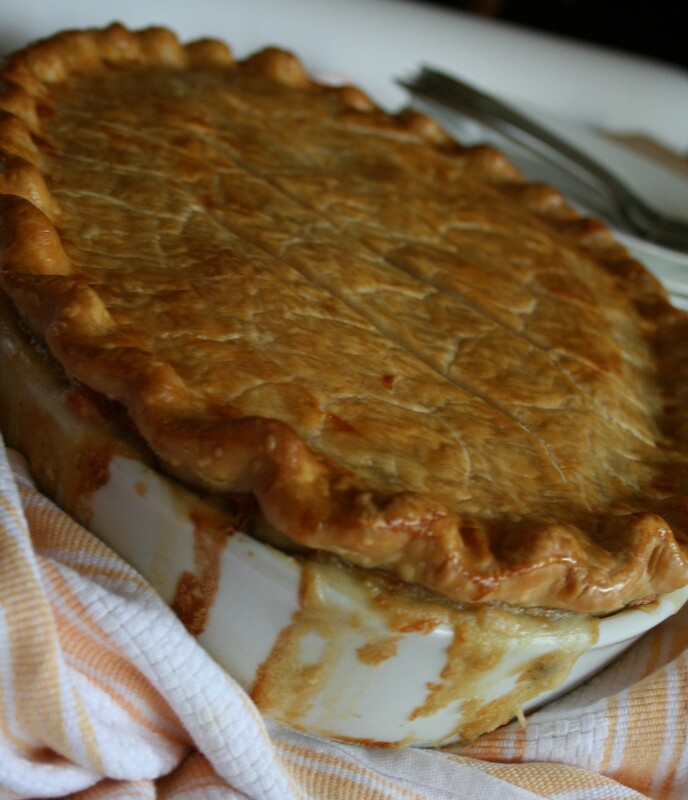 If you thought frozen pot pies were good, you need to try making a homemade one. It’s surprisingly easy to make a pot pie from scratch and I can guarantee it will be infinitely better than any store-bought version. It’s the savory sauce that makes the big difference. This version uses simple ingredients – butter, flour, chicken stock, and cream – to create a sublime filling. I use poultry seasoning to impart flavor to the dish. If you don’t have this aromatic seasoning blend in your pantry, you can make your own by grinding together 1tablespoon each of dried rosemary, dried sage, dried thyme, and dried marjoram in a spice grinder or mini food processor. Or you can simply season your pot pie filling with a pinch of the aforementioned herbs. Once the sauce is made, you can add chicken and your favorite vegetables. This version uses traditional ingredients like carrots, potatoes, and peas. Roasted root vegetables like parsnips and turnips are also delicious in a pot pie. If you are short on time, you can pick up a rotisserie chicken at your local grocery store for this recipe instead of baking your own chicken. This short-cut can save you about 30 minutes in your prep time. Once the filling is complete, top the pie with a pie dough and bake until heated through with a flaky pie crust. Besides being delicious, another wonderful thing about pot pies is that they can be made a day in advance. If doing so, either top with the pie crust just before baking or make sure the pie filling is completely cooled before topping with the uncooked pie crust. You can also freeze the unbaked pot pie to bake on a busy day. While the chicken is roasting, in a medium saucepan over high heat, bring the water to boil. Add the carrots, potato, onion, and peas and cook until crisp-tender, about 8 minutes. Drain well and set aside. Raise the oven temperature to 395 degrees. In another large pot, melt the butter over medium-low heat. Add the flour and whisk until the mixture is golden brown, about 4 to 5 minutes. Whisk in the chicken stock and cream. Add the poultry seasoning and season with salt and pepper to taste. Cook, stirring often, until thickened, about 5 minutes. Add the chicken, carrots, potato, onion, and peas. Stir to combine. Adjust the seasonings as necessary. Pour the filling into a 9- x 13-inch baking dish. On a lightly floured surface, place the two pie crusts on top of each other. Roll the dough until it is big enough to cover the baking dish. Place the pie crust over the top. Flute the edges, if desired, and cut slits in the top for steam to escape. Brush the crust with the beaten egg. In case of overflow, place the baking dish on a rimmed baking sheet. Bake until golden brown, about 35 to 45 minutes. Cooking Tip: Sometimes I top the filling with biscuits rather than the pie crust. For a short cut, you can use canned biscuits, but I prefer homemade. Just add the biscuits 15 minutes into the cooking time to prevent burning. On New Year’s Day, I leave nothing to fate. I always serve big helpings of the traditional Southern dishes that are said to bring good fortune. Two of my family’s favorites are black-eyed peas and greens. The black-eyed peas bring good luck and, since they look like money, the greens are said to bring prosperity. Since I can use good luck and good fortune any time, I decided to combine these two ingredients into one dish that can be enjoyed year round. This soup pairs these lucky foods with vegetables and smoky bacon for a dish that is hearty and satisfying. You can start this soup with dried peas, but I prefer the ease and convenience of canned peas. Canned peas require no advance soaking and cook quickly. For New Year’s, I traditionally put collard greens in the soup (don’t want to mess with my luck!) but during the rest of the year, I sometimes substitute kale. To spice it up a bit, add a dash of hot sauce just before serving. While this simple yet satisfying soup should improve your odds for the new year, it’s 100% guaranteed to make your belly happy. Place the bacon in a large stockpot and cook over medium heat until crispy, about 3 to 4 minutes. Add the onion, celery, carrots, garlic, and thyme. Cook, stirring, until the onions are soft, about 5 minutes. Add the tomatoes, chicken stock, peas, and collard greens and stir to combine. Season to taste with salt and pepper. Bring the mixture to a boil, cover, and simmer until the collard greens are tender and the flavors have melded, about 20 minutes. Adjust seasonings as needed. Serve warm. Cooking Tip: For a vegetarian version, omit the bacon and sauté the vegetables in olive oil instead. Excerpted from The Southern Pantry Cookbook by Jennifer Chandler. Photo by the talented Justin Fox Burks. Food Styling by Jennifer Chandler. If you are a fan of acorn and butternut squashes, now is the time to enjoy these hearty cooler weather vegetables. This winter vegetable first started appearing in our local farmers markets in late September and will continue to be in season throughout the winter. 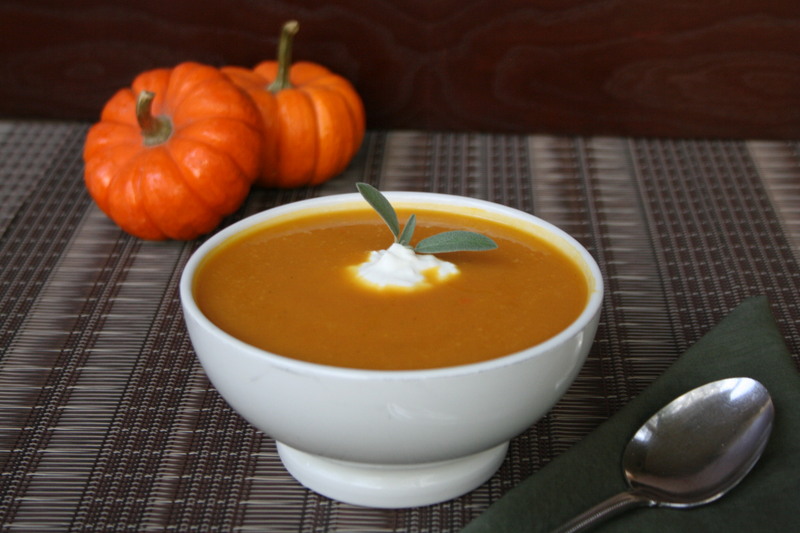 This smooth and creamy soup is one of my favorite ways to enjoy winter squashes. It is a lovely soup that warms the heart and features some of Autumn’s best flavors. And as an added bonus, it is possibly one of the easiest soups to make. Simply roast the squash until cooked, transfer it to a pot, add chicken stock, and then puree. Roasting the squash with onions and carrots adds a sweet, caramelized dimension to the flavor of the soup. Also, since you are roasting the squash, you don’t have to worry about trying to peel that tough outer layer. Once cooked, the flesh of the squash is easily scooped out. This soup is also perfect as first course for a holiday meal. Since the squash roasts in the oven, your stove-top is free to cook other dishes for the meal. You could even make it a day ahead if you like. Puree the soup in the pot with an immersion blender or in batches in a food processor or blender. If using a food processor or blender, return the soup to the pot. Adjust the seasonings as needed and heat through over medium-low heat. Serve warm garnished with a dollop of crème fraiche or sour cream if desired. Cooking Tip: If you prefer a thinner soup, simply add more chicken stock. Previously published in The Memphis Commercial Appeal. 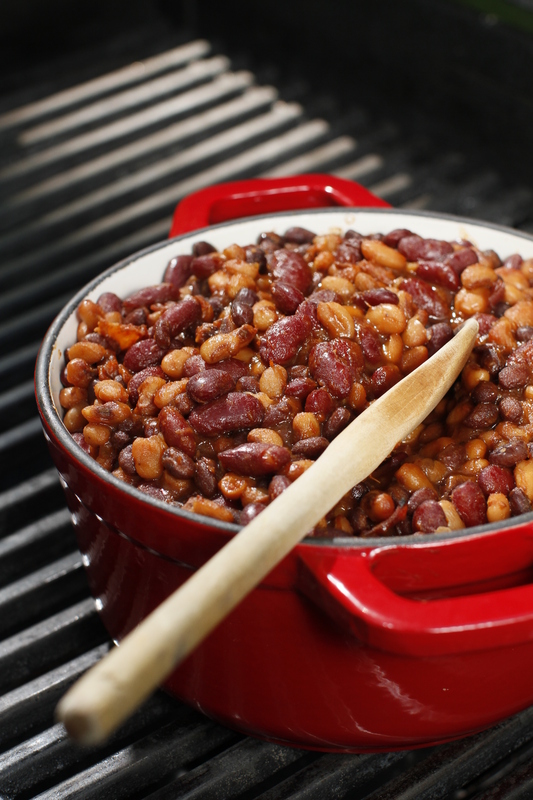 There is lots of debate of which kind of barbecue is best … ribs versus pulled pork, dry versus wet ribs, who makes the best sauce … but all agree that baked beans are the perfect accompaniment to any type of barbecue. BBQ baked beans are surprisingly easy to make from scratch and infinitely better than what comes ready-to-serve out of a can. The main ingredients are common pantry staples you probably already have on hand: beans, barbecue sauce, ketchup, brown sugar, cider vinegar, and yellow mustard. Vegetables like onions and bell peppers are ways to add more flavor. I like to add a little smokiness to my baked beans and bacon is a simple way to make that happen. The addition of a little pulled pork would make it even better. As for the beans, you could always soak dry beans but I find using canned beans is a great time saver. I like to use a variety of beans in my BBQ baked bean recipe. This simple twist provides both flavor and color to this classic picnic side. The key to a good batch of baked beans is to let them slow cook for several hours. The extended cooking time allow the flavors to blend and meld together. Most folks cook them in the oven, but you can also cook them in a slow cooker or even on a grill with the lid closed. You’ll find these Southern BBQ Baked Beans are the perfect accompaniment to so many dishes traditionally served during this summer. So remember this recipe not just when making barbecue, but also when grilling chicken, burgers or serving a crowd. Place the bacon in a large stockpot or Dutch oven over medium heat and cook, stirring often, until crispy, about 3 to 4 minutes. Add the onion and bell pepper. Cook, stirring, until the onions and peppers are soft, about 5 minutes. Add the black eyed peas, red kidney beans, pinto beans, barbecue sauce, cider vinegar, yellow mustard, and brown sugar. Stir until well combined. Season with salt and pepper to taste. Bring the mixture to a boil over high heat. Remove from the heat, cover, and place in the oven. Cook until the beans are fork tender, about 1 1/2 hours. Serve warm. 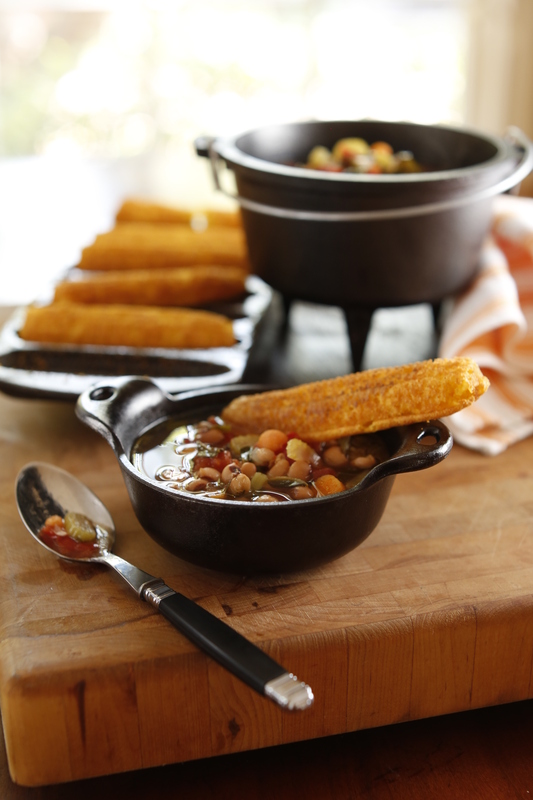 Variation: Want a traditional BBQ baked bean dish? Just use three cans of kidney beans instead of the various types listed in this recipe. Chicken tortilla soup is the Southwestern cousin of mom’s chicken noodle soup, just with a little more kick and a crunchy topping. And, like it’s relative, it warms the soul and makes you feel good all over. This quick, no-fuss soup has loads of flavor and uses ingredients that are typically on hand. The soup doesn’t take long to make. In fact, it can be on your table in less than 30 minutes. It’s also an ideal way to transform leftover chicken into a tasty and satisfying dish. It has become a favorite in my house since my good friend Melissa Petersen of Edible Memphis shared this recipe with me. Much healthier than it tastes, this broth based soup is loaded with tomatoes, lean chicken, and heart healthy avocado. The cumin and oregano add a richness and depth to the dish without any fat. If you want a little extra kick, add a few dashes of your favorite hot sauce. I like to top mine with a few homemade corn tortilla strips, which are surprisingly easy to make. Just cut corn tortillas into thin strips and fry for about 1 minute in a skillet with vegetable oil. If short on time, use crushed tortilla chips instead. Baked tortilla chips would be a heart-healthy alternative. Serve with a side salad or a slice of cornbread and you have a satisfying meal. To prepare the tortilla strips, pour enough oil into a large stockpot so that you have a quarter-inch layer of oil. Warm the oil on medium-high heat until a few droplets of water sizzle when carefully sprinkled in the pot. In batches, fry the tortilla strips until golden brown on both sides, about 30 seconds to 1 minute per side. Use metal tongs or a slotted spoon to lift the tortilla strips out of the pan, draining the excess oil as you do so. (The tortilla strips should be fairly stiff and crisp. If not, the oil is not hot enough.) Transfer the tortilla strips to a paper towel-lined plate to absorb the excess oil. Lightly season with salt and pepper while they are still warm. In another large stockpot over medium-high heat, warm the olive oil until a few droplets of water sizzle when carefully sprinkled in the pot. Add the onion and sauté until soft, about 5 minutes. Add the garlic, cumin, and oregano and cook until fragrant, about 1 minute. Add the tomatoes, chicken stock, and shredded chicken. Over high heat, bring the mixture to a boil. Reduce the heat to medium and simmer until the flavors have melded, about 15 minutes. Season with salt and pepper to taste. 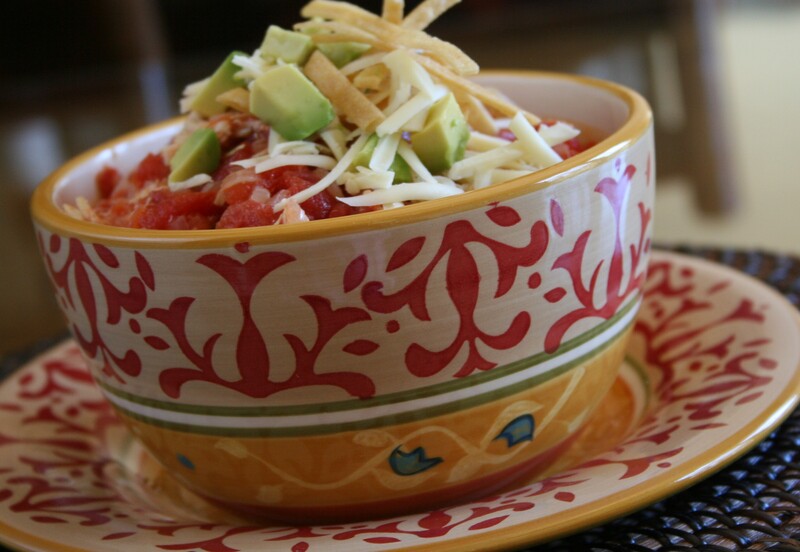 Ladle the soup into bowls and garnish with the fried tortilla strips, cheese, avocado, and fresh cilantro. Serve immediately. Do-Ahead: The soup can be made the night before or frozen in advance. Just be sure to add the garnishes (tortilla strips, cheese, and avocado) just before serving. Story excerpted from Jennifer Chandler’s bi-weeky Commercial Appeal newspaper column Dinner Tonight. Photo and Food Styling by Jennifer Chandler. A decadently creamy Alfredo sauce is probably the quickest and easiest pasta sauce to whip up. Made simply of butter, Parmesan cheese, and heavy cream, a homemade version of this sauce is infinitely better than anything you could buy pre-made at the store. This popular sauce was invented by Roman restaurateur Alfredo di Lelio back in 1914. He added Parmesan to a classic butter sauce in an attempt to create a dish that would be appetizing to his pregnant wife. Little did he know that this simple three ingredient sauce would become a classic in the United States thanks to Hollywood actors like Douglas Fairbanks that frequented his restaurant. Since the sauce is made of just three ingredients, it is important to use high-quality components. Never use margarine or a butter substitute. Also, look for a wedge of a good Parmesan in your deli department. Pre-grated cheese won’t give you as flavorful as sauce or melt as smoothly. I like to add a touch of freshly ground nutmeg to all my cream sauces. It’s a trick I learned in culinary school in France. The nutmeg adds another layer of flavor to a dish. A dish is fine without it, but a little can add that special touch to the end result. The trick is to always use freshly grated nutmeg and never use the powdered version. 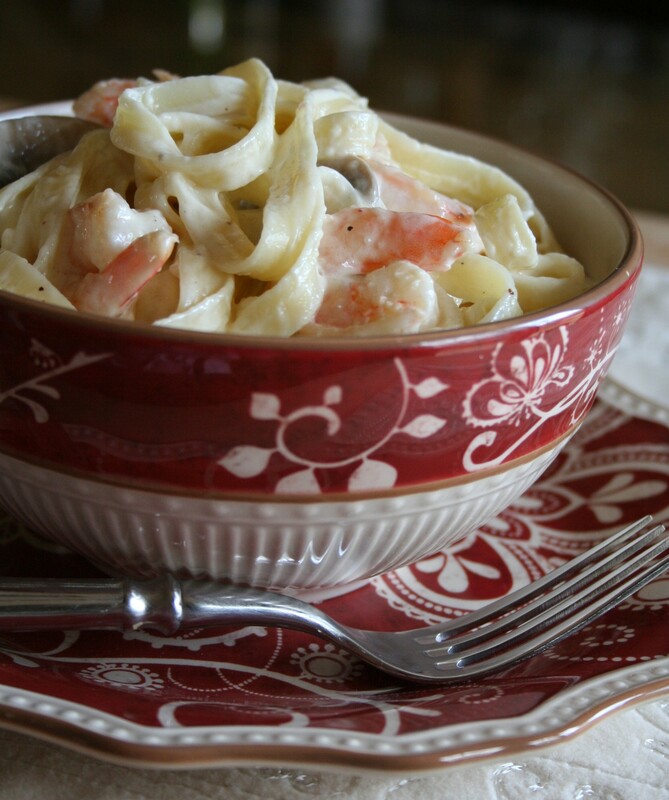 Serve Alfredo sauce plain over your favorite pasta or dress it up with sautéed shrimp and mushrooms like I do in this version. Chicken could easily be substituted for the shrimp if you are not a seafood fan. To make the Alfredo sauce: In a medium saucepan over medium-high heat, bring the heavy cream and butter to a boil. As soon as it boils, stir in the Parmesan cheese and cook until melted. Remove the sauce from the heat and add the nutmeg. Season with salt and pepper to taste. Cover and keep warm. To assemble the pasta: In a large sauté pan over medium-high heat, melt the butter and oil. Add the mushrooms and cook, stirring frequently, until the liquid from the mushrooms evaporates and they become slightly golden, about 10 minutes. Add the onion and garlic and cook until the vegetables are soft, about 5 minutes. Add the shrimp and sauté until cooked through, about 4 minutes.In a large mixing bowl toss together the warm pasta, the Alfredo sauce, and the shrimp mixture. Season with salt and pepper to taste. Garnish with Parmesan cheese, if desired. Serve immediately. Recently I was at my friend Lucia’s house and she gave me a pint of the veggie soup she was making. I am not normally a huge fan of cooked cabbage so I was pleasantly surprised to find out how tasty the soup was. When she told me how easy it was to make, I knew this was one I needed for my repertoire. And to top it all off – this soup has nothing bad for you in it! Lucia uses fire-roasted canned tomatoes and I think that is the key. They add a nice depth of flavor to the soup. I made a big pot and then froze it in one serving portions so I have a quick go-to lunch or supper when I don’t have time to cook! 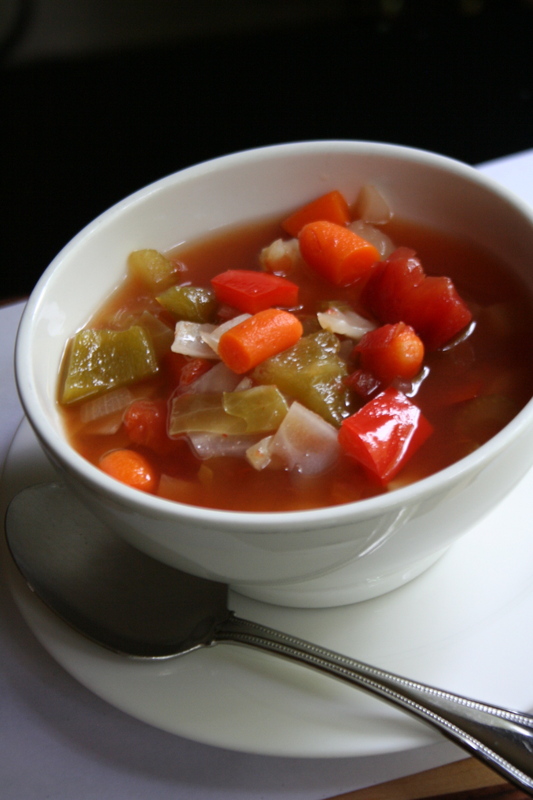 Place the onion, bell peppers, cabbage, carrots, tomatoes, garlic, and vegetable broth in a large stock pot. If needed, add water until all the vegetables are covered. Season with salt and pepper to taste. Bring to a boil over high heat. Cover and reduce the heat to medium. Simmer for 1 1/2 hours. Serve warm. Season with hot sauce if desired.